There are a few applications that I truly missed when I went all Google. Sparrow was one, and Tweetbot was another. Tweetbot in particular was a noticeable hole, and if I had my druthers, it’d be ported to every platform. Thankfully, my wishes are being partially granted, as Tweetbot is coming to OS X. Better yet, you can grab a pre-release copy today. The application is in alpha right now, which isn’t normally worth a full post. But this launch in particular is more important than one app. It’s representative of the general apprehension inside of Twitter’s third-party developer ecosystem. Before we get to the apprehension and doom-and-gloom, though, let’s look at the application itself. I’ve been using it for the last week or so, and it’s a nice addition to my Macbook Pro with Retina Display. 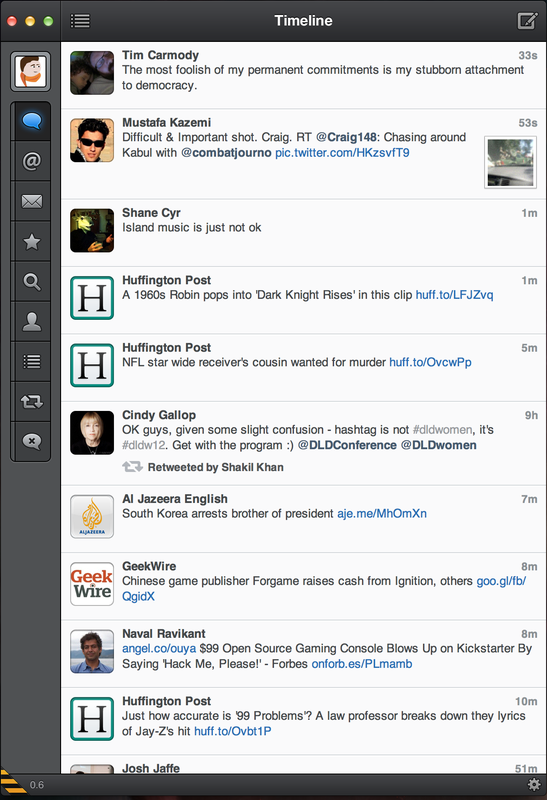 To keep it short, Tweetbot for Mac is exactly what OS X has been missing. There are a few key features that make the app stand apart from the in-house Twitter for Mac client. There’s the third-party support of Instapaper, Instagram, Tweet Marker, and other Twitter-related services. It may not seem like a big deal, but the current version of Twitter for Mac doesn’t have this support built-in, because the companies haven’t reached agreements with Twitter. This alone makes the application worth testing out. Then there’s the inclusion of a Retina-enabled version. It’s not a deal-breaker for most people, but the fact that Twitter -- a company with an incredibly close relationship to Apple -- isn’t supporting Apple’s new flagship computer, is a tad bit ridiculous, to say the least. At least with Tweetbot, Twitter addicts such as myself don’t have to look at the nausea-inducing application that is Twitter for Mac. Aside from these features, the release of this application today is significant for the Twitter ecosystem. After being acquired by Twitter, the Twitter for Mac (formerly Tweetie) client has remained relatively unchanged over time. It’s nice to have consistency in an application, but at the same time, a little bit of change never hurt anyone too much. The unchanged state of Twitter on the Mac has left open a big hole in the ecosystem, which apparently can only be filled by a third-party. These types of holes are really the key reason why Twitter shouldn’t shut off the third-party API as many fear. The in-house Twitter applications get the job done, but some users need more powerful versions like Tweetbot. If Twitter won’t make them, and won’t enhance the applications it buys (Tweetie, Tweetdeck, etc. ), then someone needs to fill that void. If Twitter does decide to shut off full-featured Twitter client’s third-party access, it could have serious repercussions on the ecosystem. In fact, more than one Twitter developer I spoke to feared that Twitter would cut off access in the coming weeks, and will then force users to either use the in-house clients, or to use the Web interface. Not only would it create some serious bad blood for Twitter, but it could force some Twitter developers to look to other platforms. It might boost Twitter’s bottom-line, but it will also hurt the company’s reputation. Not to draw too much out of a product launch, but seeing how Twitter reacts to the continued improvement of Tweetbot and other third-party apps like Osfoora will give a good snapshot of how Twitter is going to be moving forward. In the meantime, though, you can test out the alpha version of Tweetbot over here for free. Keep in mind that this is prerelease software, that it is buggy, and that it isn’t fully supported yet. But it is free, and it’s already better than Twitter for Mac.